The promise of regenerative medicine to revolutionize medical care for a wide variety of diseases is great. Therapies using blood stem cells and bone marrow transplants for treating certain blood diseases have been developed over the last four decades and are in widespread clinical use. Yet most other potential applications using stem cells and novel regenerative medicine approaches are early in development. The basic biology of tissue regeneration remains poorly understood and is the subject of intense scientific investigation. Realizing the promise of regenerative medicine as these new therapies are pioneered will take decades. For a few applications, early clinical trials are emerging at the University of Wisconsin and around the world. 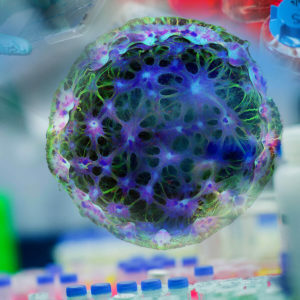 What are stem cells? by Craig A. Kohn. TED-Ed video and curriculum produced in conjunction with the SCRMC. Image courtesy of Michael Schwartz of the Thomson and Murphy labs. It’s rare when a single discovery ushers in a new era of science, placing a clear “before” and “after” signpost on the timeline of scientific progress. The development of the first vaccine in 1797. The discovery of the structure of DNA in 1953. The first isolation of a human embryonic stem cell in 1998. In November 1998, the journal Science published James Thomson’s groundbreaking work on embryonic stem cells. For the first time, scientists could explore the immortal cells capable of becoming all the cells in the human body. There has been 20 years of progress since the initial discovery spawned a new field of research, and tremendous potential exists for the future. The discovery changed the world, and it changed Wisconsin. We reached out to the people who lived it, and they shared the experiences in their own words. This is their story.